Be my Valintine?. . Wallpaper and background images in the Young Justice club. Yes!Yes!And 100000000000000000000000 times YES!!! I luv u Robin!!! Now kiss me. <lol.:).Send!! hmmmmmmm let me think about that......................................­...­...­...­...­...­...­...­...­...­...­...­...­...­...­...­...­...­...­...­...­...­...­...­...­...­YES­!!!­!!!­!!!­!! 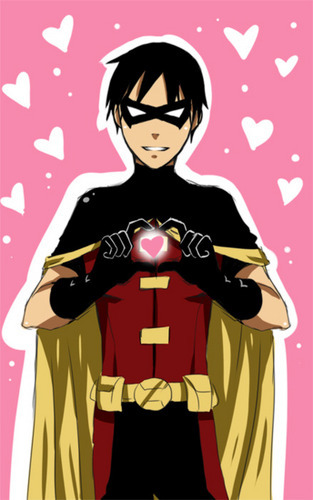 Love Robin to the fullest! Should be my new motto! I AM!!!!!!!!!!!!!!!!!!!!!! Couldn't you tell? Need I say anymore? OH yeah, yesyesyes!!! I love you Skittles98! You made my life so much better!!!!!!!!!!!!!!!!! Thank you so much! You're so awesome! And please, for the love of all things whelming, add more pics/stories/whatever! It needs to be Robin and you need to do it cuz I'm not on all the time or I would! So please do this for me!!!! STUPID PEOPLE! But I'll love you forever Robin! Whenever you need me, whenever you want me, whenever you say the word, I'll be there! And NOTHING will stop me from getting to you! I love you more than the stars in the universe (which is neverending)! XD *sigh* be still my Robin filled heart!